Q: Who would hit a total stranger in the head with a soda can full of bong water they just happened to have in their car? A: A California Liberal. Who else? This week Frontline America’s Ben Bergquam was attacked by intolerant leftists who showed up to an American flag rally armed with cans and bongwater, ready to fight. Bergquam, a Fresno-area Patriot, is no stranger to controversy. President Trump’s 2016 election motivated him to become more politically active. Since then, Bergquam can regularly be found on Fresno State’s campus, sporting a MAGA hat as he works to raise awareness of Liberal hypocrisy. On the day of the attack Bergquam and other supporters of President Trump’s America-first policies were proudly waving flags on a street corner in Temecula. 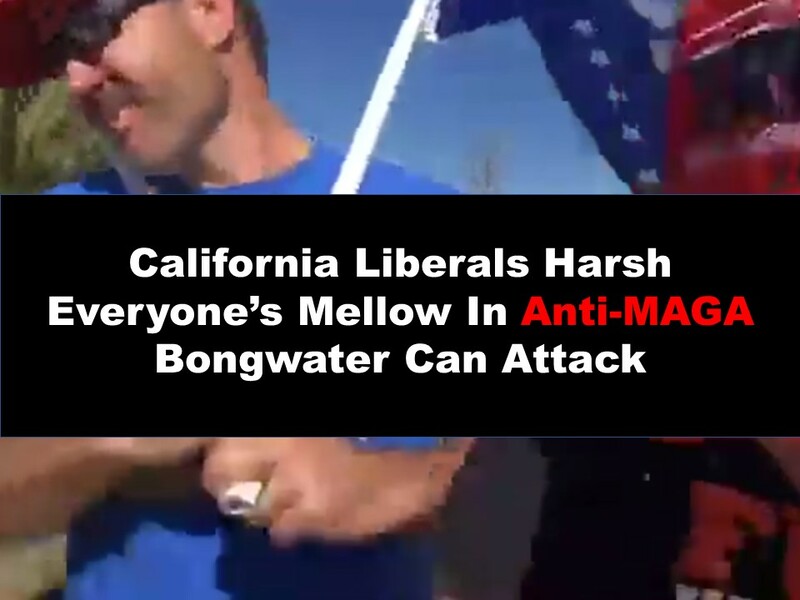 You can see footage of the MAGA bongwater attack HERE. The can hits Bergquam at the 13-14 second mark, just as he’s saying, “You know it’s funny, people think of California as all crazy liberals that have lost their minds…” Leave it to Liberals to show the rest of us exactly why that is. It is unclear whether or not the Liberal attackers showed up specifically to assault Bergquam with their recyclables instead of recycling them or if this was a hate crime of opportunity. How ironic that California, a state known for tolerance, would not make a move to condemn this kind of behavior. So far there have been no reports of manhunts, calls to identify the attacker, or anything else that signals even a bare minimum of effort to pursue justice. Of the attack Bergquam said, “This is the kind of disrespect we have in our country,” and he’s right. Liberals ruin everything they touch, especially in California where they can’t even seem to appreciate the legal recreational marijuana laws they enjoy enough to refrain from using bong water to commit a violent crime. This is not the only instance of Liberals attacking innocent people when they should reasonably be too high to do so, and, unfortunately, it won’t be the last. Want to meet real Patriots for uncensored, Liberal-free talk? Join me, Rob Raskin, at ProAmericaOnly.org. I started PAO so real American Patriots would have a place where their voices can be heard, without the censorship and banning we experience on other sites. We’re social media that puts America first, and we need great Patriots like YOU to help us MAGA. Vape shop worker loses it and attacks MAGA supporter.